Christmas is coming up fast this year. Then again, this whole year really did fly by in my opinion. I personally love to shop early for Christmas gifts and get it out of the way but I know a ton of people who wind up scrambling for useful last minute Christmas gift ideas, either because life happened or because they purposely put off shopping in hopes of scoring a late deal. To each his own, but if you think you’ll end up doing some last minute Christmas shopping this year, don’t feel that you have to settle for the short end of the stick. 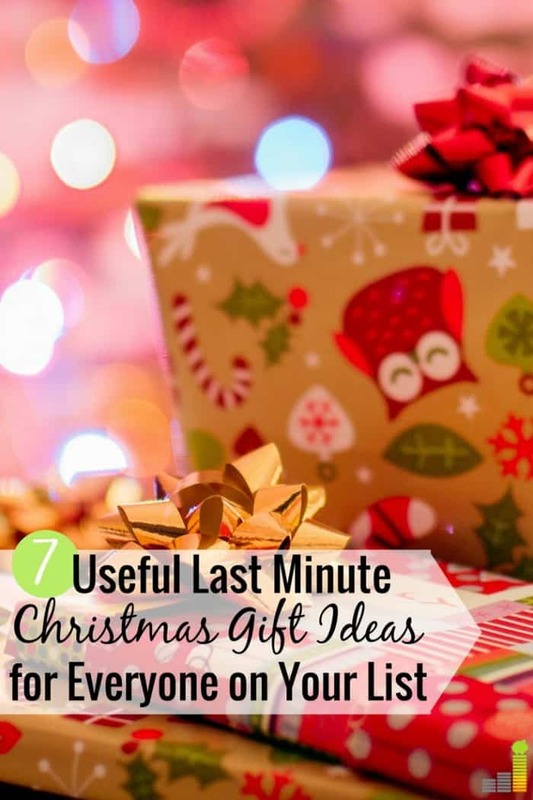 You can still snag some budget friendly thoughtful and useful gifts for loved ones. Here are seven awesome last minute Christmas gift ideas to consider. Gift cards are a classic last minute Christmas gift idea but yours doesn’t have to be so cliche this holiday season. Instead of picking up that same old iTunes or restaurant gift card, choose a gift card for someone on your list that will help them enjoy a new experience. There are hundreds (maybe even thousands) of interesting gift card options available these days so you don’t have to stick with the normal retail and restaurant options. If a family member has mentioned wanting to go indoor skydiving before, grab them a gift card to the nearest place that offers that experience. Living Social is a great option for those wanting to give an experience type gift if you want to pick from multiple options. The other day, I was in the store and saw a Southwest Airlines gift card. This would be an awesome last minute Christmas gift idea for someone who likes to travel or has a few trips planned for the following year. Check out sites like Cardpool to score discounted gift cards. If an experience isn’t something your friend or family member would like, an American Express Gift card is always a good option to just give cash. Most people who don’t have an Amazon Prime membership secretly want one or will once they learn about all the perks involved with having one. An Amazon Prime membership is $99 per year or $33 per quarter and includes free two-day shipping, instant access to millions of videos, songs, and books, plus unlimited photo storage in Amazon Drive and more. For anyone who even shops on Amazon occasionally or is interested in streaming popular shows and movies or listening to audiobooks via Audible, Amazon Prime proves to be a great last minute Christmas gift idea. If someone already has Amazon Prime, consider getting them a Fire TV Stick instead! This can be a creative last minute Christmas gift idea for anyone who loves to collect and display photos around their home or for someone who’s recently celebrated a milestone. I did this for my in-laws for Christmas last year because they love to collect and hang up photos around the house. You can print out images from a digital camera or your phone for just a few cents at stores like Walgreens, CVS and Walmart. Then, you can easily find a reasonably priced frame on Amazon. If you don’t have any photos to print out, consider grabbing a scrapbook as an awesome last minute Christmas gift idea instead. I scrapbooked my son’s entire first year when he was born so this would be a good idea for a new parent or just someone who likes to work on these creative projects in general. Know someone who needs to loosen up? Just kidding but seriously, we all may feel at times like we can use a good massage; the problem is that they can be so expensive. That’s where portable massagers come in. These little devices make great cheap last minute Christmas gift ideas. Amazon sells an array of handheld massagers that make great gifts. They typically run anywhere from $15 – $35 and will definitely be useful to whoever receives the item as a Christmas gift. Living Social is another great option if you want to truly treat the recipient with a moderately priced one-time massage. We go through candles like crazy at our house. If you know someone similar, they will appreciate a tall scented candle, or five. Select a candle that smells great and will make the house warm and cozy for the holidays. You can find candles in most stores so just select one that fits within your budget. Bath & Body Works, as well as Amazon tend to have some solid options and even better sales up until Christmas and even after the holiday. Know anyone who loves to watch and collect movies? With the best cable TV alternatives pretty much taking over, it’s important to realize that these services don’t offer every movie to T.V. show option ever made (especially most new releases). Thus, DVDs and Blu-ray discs still make useful last minute Christmas gift ideas. If you know someone who’s been dying to catch up on Game of Thrones and can’t watch it on demand, you can purchase the whole season for them for Christmas. Sites like SecondSpin are offering extreme discounts on movies this time of year so even if you only have $30 to spend, you still might be able to get multiple items. A portable battery pack is super handy especially for someone who travels a lot and constantly needs to keep charging their devices. Some of these things even charge multiple devices at once. You can find some of the top portable battery packs on Amazon, with most of them costing under $40. While the thought always counts, usability is another important factor when shopping for last minute Christmas gifts. If you’re a last minute shopper, focus on choosing gifts that others will love and will be able to put to use right away. 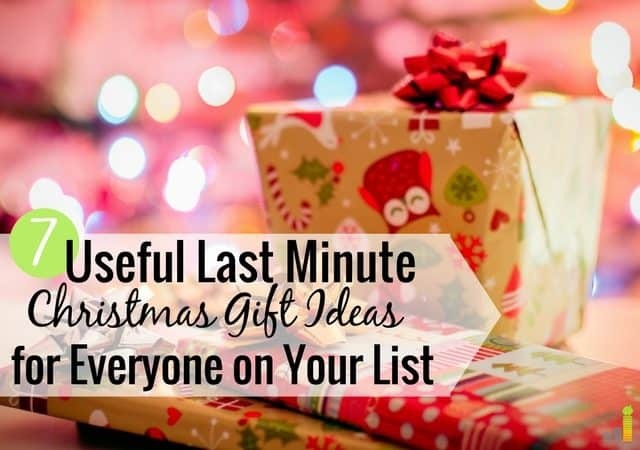 Latecomers don’t have to settle for slim pickings with any of these useful last minute Christmas gift ideas mentioned above. Have you started Christmas shopping yet or are you more of a last minute shopper? Which one of these last minute Christmas gift ideas would be a perfect for someone on your list? What are some of your go-to gifts when shopping on a budget? Great ideas! I really love how you mentioned gift cards can be more personalized. Sure, I would use a gift card to Target, but a gift card to a new restaurant or experience might allow me to try something I would have had a harder time budgeting for myself. Yup, I also have a hard time spending money on myself for certain things so I always like to receive gift cards. Instead of an Amazon membership I would recommend an Amazon gift card. Memberships are nice but I imagine most people I know already have Prime. I’ve also found Netflix gift cards to be good gifts as they are really easy to use even if you already have a membership. I know some people want Amazon Prime but don’t want to pay for it but if they already have the service, an Amazon gift card would also do the trick.